Stroll through 40 acres of tulips and daffodils in bloom while enjoying food, wine and fun for the whole family! Our favorite time of year is when the tulips bloom! 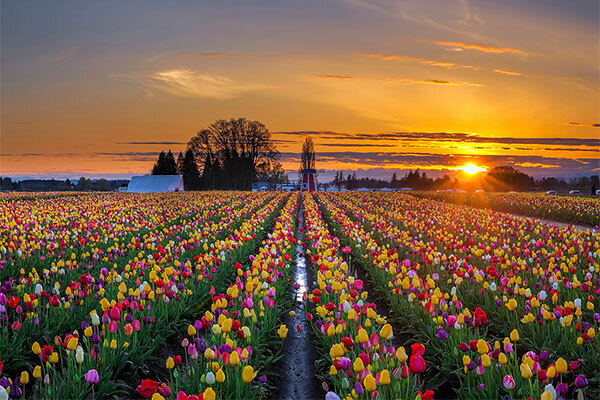 The Wooden Shoe Tulip Fest is an invitation from our family to yours to enjoy all things that make spring in the Northwest. Stroll through 40 acres of stunning beauty, experience expansive views of vineyards, distant mountains, and a few mud puddles. Fresh flowers, food, and fun for the entire family, including well behaved dogs on leashes! Trying to decide what to do in Portland? Check out events like this one, just a short distance from our Portland boutique hotel. A stay at Hotel Eastlund means you’ll be across the street from the Oregon Convention Center, next to the Moda Center and close to the best destinations, restaurants and attractions Portland has to offer. Whether you’re here for business, pleasure or looking for an event space in Portland, we look forward to helping you discover this beautiful city.